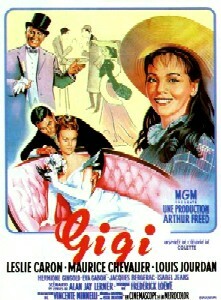 Gigi (1958): Dir. Vincente Minnelli. Written by: Alan Jay Lerner. Lyrics by Lerner. Music by: Frederick Loewe. Based upon the novella of the same name by Colette. Starring: Leslie Caron, Louis Jordan, Maurice Chevalier, Hermione Gingold, and Isabel Jeans. Unrated. Running time: 115 minutes. Yes, the Academy elected another Minnelli-Lerner musical for Best Picture, also set in Paris and also starring Leslie Caron. It’s another light-hearted musical that’s a bit more substantive than its predecessor, but just as sugary sweet. At the turn of the twentieth century, both the free-spirited Gigi and the charming Gaston feel imprisoned by their respective social standings: Gigi trains as a courtesan, while Gaston grows bored with his bouts of debauchery. With all his money and fame, Gaston only feels at ease spending time with Gigi and her grandmother, and soon realizes he’s fallen in love with the woman Gigi has become. But can he leave his old life behind? Like An American in Paris, Gigi lavishes the senses with Parisian spectacle, albeit about 50 years prior. The costume and production design are painstakingly rendered, vibrant in color and detail. And so too is the music, with a touch of satire, parodying the rigidity of “cultured” lifestyles. But those seeking a thorough exploration of social mores best stick with Sondheim. Even as the film surpasses American in terms of substance, it nevertheless remains predictable, and largely saccharine. The sense of menace in Colette’s book is brushed off in favor of colorful musical numbers. And even as Gaston struggles to make sense of his feelings for Gigi, the inevitability of their marriage saps any tension or drama from the proceedings. To be sure, Leslie Caron and Louis Jordan play more interesting characters than Caron and Gene Kelly in American, but it’s still rather thin material. Gigi has some clever songs, but they’re more concerned with pomp and circumstance than with furthering plot or character. I hoped to see a bit more, even from a Minnelli musical.